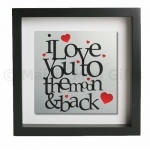 Metal wall art mounted within a box frame. 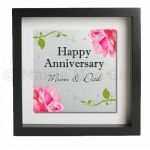 A dad design great for a Birthday or Fathers Day Available with black or white frame. 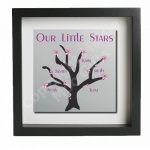 Metal wall art mounted within a box frame. The Family Established design is personalised with a family surname and a year. 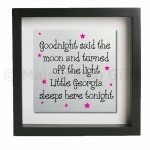 Available with black or white frame. 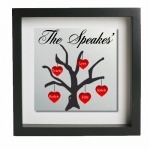 Metal wall art mounted within a box frame. 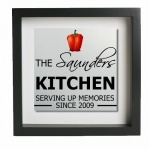 The Family Serving Up Memories design is personalised with a family surname and a year and is great to brighten up a kitchen. Available with black or white frame. 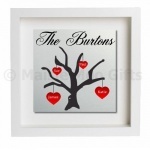 A personalised family tree design (5 names) piece of metal wall art mounted within a box frame. Available with black or white frame. Metal wall art mounted within a box frame. 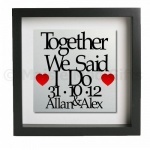 The design Happy Anniversary and can be personalised with two names and a date if required. Available with black or white frame. 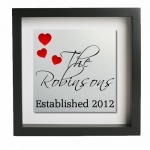 Personalised wedding date, and names metal wall art. Available with black or white frame. Metal wall art mounted within a box frame. 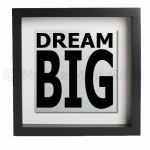 The design reads DREAM BIG. Available with black or white frame. Metal wall art mounted within a box frame. 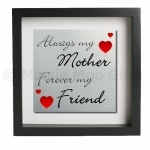 The design reads Always My Mother Forever My Friend. Available with black or white frame. Metal wall art mounted within a box frame. The design reads Life isn't about waiting for the storm to pass, its about learning to dance in the rain. Available with black or white frame. Metal wall art mounted within a box frame. 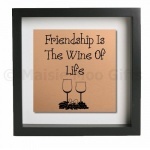 The design reads Friendship Is The Wine Of Life. Available with black or white frame. Metal wall art mounted within a box frame. 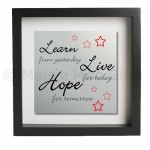 The design reads Learn from yesterday, Live for today and Hope for tomorrow. Available with black or white frame. Metal wall art mounted within a box frame. The design reads I Love You To The Moon & Back. Available with black or white frame.